The basic principle of hydropower is that if water can be piped from a certain level to a lower level, then the resulting water pressure can be used to do work. If the water pressure is allowed to move a mechanical component then that movement involves the conversion of the potential energy of the water into mechanical energy. Hydro turbines convert water pressure into mechanical shaft power, which can be used to drive an electricity generator, a grinding mill or some other useful device. The use of falling water as a source of energy is known for a long time. In the ancient times waterwheels were used already, but only at the beginning of the nineteenth century with the invention of the hydro turbine the use of hydropower got a new impulse. Small-scale hydropower was the most common way of electricity generating in the early 20th century. In 1924 for example in Switzerland nearly 7000 small scale hydropower stations were in use. The improvement of distribution possibilities of electricity by means of high voltage transmission lines caused fainted interest in small scale hydropower. Renewed interest in the technology of small scale hydropower started in China. Estimates say that between 1970 and 1985 nearly 76,000 small scale hydro stations have been built there! Hydropower is a very clean source of energy. It does not consume but only uses the water, after use it is available for other purposes (although on a lower horizontal level). The conversion of the potential energy of water into mechanical energy is a technology with a high efficiency (in most cases double that of conventional thermal power stations). The use of hydropower can make a contribution to savings on exhaustible energy sources. Each 600 kWh of electricity generated with a hydro plant is equivalent to 1 barrel of oil (assuming an efficiency of 38 % for the conversion of oil into electricity). it is a long-lasting and robust technology; systems can last for 50 years or more without major new investments. lack of familiarity with the technology and how to apply it inhibits the exploitation of hydro resources in some areas. To know the power potential of water in a river it is necessary to know the flow in the river and the available head. 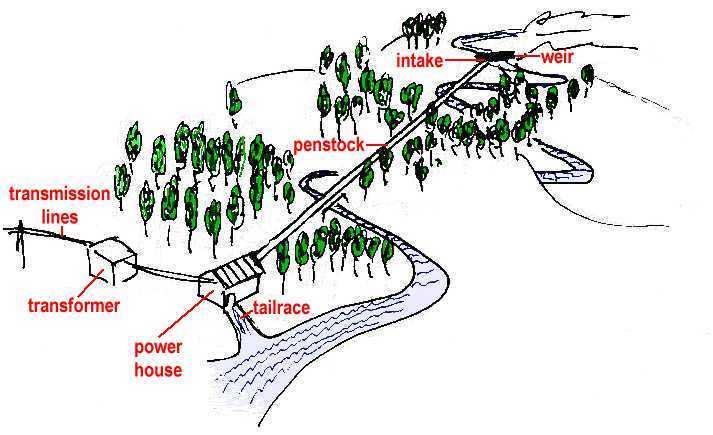 The flow of the river is the amount of water (in m3 or litres) which passes in a certain amount of time a cross section of the river. Flows are normally given in cubic meters per second (m3/s) or in litres per second (l/s). Head is the vertical difference in level (in meters) the water falls down. Components of a typical high head hydro installation. The theoretical power (P) available from a given head of water is in exact proportion to the head H and the flow Q. The constant c is the product of the density of water and the acceleration due to gravity (g). This available power will be converted by the hydro turbine in mechanical power. As a turbine has an efficiency lower than 1, the generated power will be a fraction of the available gross power. Small general term for installations smaller than 1000 kW (or < 10,000 kW). Also used for installations in the range between 500 and 1000 kW. Large scale hydropower stations are equipped with large dams and huge water storage reservoirs. In these reservoirs large amounts of water can be stored when supply of water is higher than the demand. Water from wet periods can be used in this way to supplement water supply in dry periods (or even dry years). In the sixties and seventies large hydropower stations looked as the solution to the energy crisis in developing countries. In that period many large scale hydro schemes were built. Examples are Aswan in Egypt, Tarbela in Pakistan, Cabora Bassa in Mozambique and Kariba in Zimbabwe. The enthusiasm for projects like those has disappeared nowadays. The extreme high sums of money involved, the long money-recovery time and the huge environmental costs are debit to this. Specially the high environmental costs are a point of great concern: losses of fertile arable land, forced migration of large groups of people and the dangers of malaria and bilharzia inherent to non-moving water. Small scale hydropower stations combine the advantages of hydropower with those of decentralised power generation, without the disadvantages of large scale installations. Small scale hydropower has hardly disadvantages: no costly distribution of energy, no huge environmental costs as with large hydro, independent from imported fuels and no need for expensive maintenance. Small scale hydropower can be used decentralised and be locally implemented and managed. Power generated with small hydro station can be used for agro-processing, local lighting, waterpumps and small businesses. as only some information is available about the potential power often not more then 10 % of the potential is used. All other activities are called consumptive. These include all uses of energy to upgrade standards of living. Consumptive use will therefore take place in or near the house. Besides consumptive and productive use a distinction can be made between the use of power in a mechanical way or in the form of electricity. All together the following table can be formed. 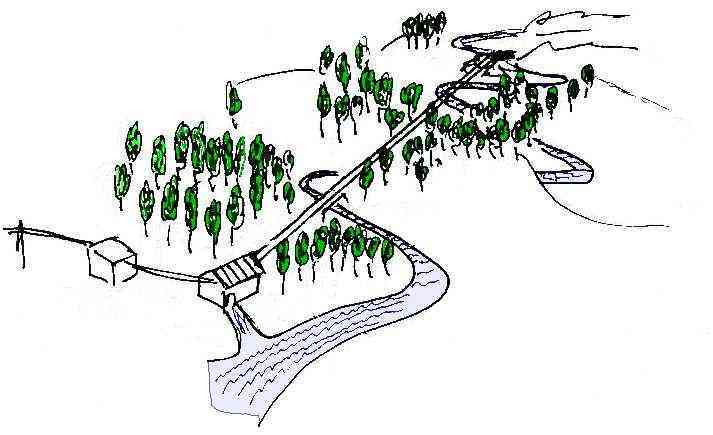 Using the energy generated with a hydro scheme in a mechanical way has some advantages over the use of electricity as intermediar. Table 2 provides a summary comparison of the advantages and disadvantages of electrical and mechanical forms of energy.